Description: Giant lily (also known as Gymea lily) plants are grown both for their huge, spectacular flower heads and for their large, flat green leaves. Each globular flower head can be up to 70 cm across and composed of a mass of red flowers each 10 cm across with unusual green pollen on the anthers. Undeveloped flower spikes (or ‘spears’) are also used in floristry. With stems up to 4 m long, these massive flowers are popular for corporate displays. Flowers can also be used individually. The sword-shaped leaves may be up to 2 m long and are very versatile for floristry. Those grown under shade are of better quality. Be aware that this plant is protected in NSW - consult your state’s native flora management plans to determine whether approval to grow or sell giant lily is required. Flowering season: Mostly June to September, with some spikes from April and late flowers to February. Leaves available all year round. Tips for florists: Handle with care - the large flower head is easily bruised. Avoid flower heads with folded, creased or torn bracts. Ensure individual flowers not blemished, bruised or broken and have minimal bract browning. Avoid blooms with chilling injury (apparent as discoloration and watery breakdown of the bracts; the critical temperature for this to develop is unknown but likely to be <0 °C). Recut stems and place into fresh water containing a registered biocide. Store flowers upright to stop them bending themselves upwards, causing misshapen heads. Description: Each flower head consists of many florets crowded onto the central dome and surrounded by silvery pink bracts. Grouped in several tiers, the short, outer rows are scaly while the inner rows are larger and more attractive. The bracts surround a buff-coloured centre which is dark burgundy at the tip. Origin: ‘Pink Ice’ was developed in Australia. 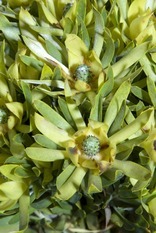 Most proteas originate from South Africa. Tips for florists: Avoid poorly coloured, damaged, deformed, asymmetrical or dull flower heads and blooms that are too open. Make sure the bracts are undamaged. Avoid stems with leaf blackening or bypass shoots at the base of the flower head. Recut stems and place into fresh water containing a registered biocide. Sell quickly. Leaf blackening is likely to be a greater problem with storage. Description: Beautiful brush-like greenish-yellow flower heads composed of hundreds of tiny florets. First florets to open are those at the base of the flower head. Foliage is dramatic and a major feature – stiff green leaves with a zigzag edge. 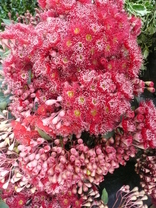 Flower heads dry well and are also sold dried and dyed. The woody fruit (or cone) is also marketed. Typical vase life: 14 days. Tips for florists: Look for clear greenish yellow (almost luminescent) flower heads. Avoid asymmetrical, deformed or damaged blooms and flower stems with bypass shoots at the base of the flower head. Avoid dull, dried out flower heads and stems with dull green leaves – these are old stock. Recut stems and place into fresh water containing a registered biocide. To increase water uptake and improve hydration it may be worth holding the stems in deep water (e.g. 20 cm). This banksia is not ethylene sensitive. 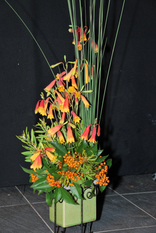 Description: Spectacular seasonal focal flower and a vibrant addition to short term displays and arrangements. Flowering gum blossom is relatively new to floristry - stunning selections (mainly hybrids in the ‘Summer Beauty’ group) have dense terminal masses of very large blossoms in many colours, from cream through pink to red, orange and deep crimson. Prominent yellow or gold stamens give a lovely contrast. Very decorative in bud - lovely to watch the caps lifting and the blossom popping out! This happens very quickly! Botanical name: Corymbia ficifolia (formerly Eucalyptus ficifolia) and hybrids of C. ficifolia, C. ptychocarpa (a tropical species). Origin: C. ficifolia native to a small coastal area of WA. Nurseries have selected a range of improved forms (providing a wonderful colour range) and graft them onto rootstocks to suit production in a variety of climates and soil types. Typical vase life: 5 days but poorly handled product can have a vase life of only 1 day! Keep the stems well hydrated, remembering that the thick woody stems drink a lot of water. Tips for florists: Choose bunches with full buds just showing colour and the caps starting to lift on around a third of the blooms. Look for fresh green and crisp leaves. Avoid bunches where too many flowers are already open. Hold in deep, clean water with an added registered biocide. Avoid sugar - this stimulates flower opening and nectar production, which can lead to problems with botrytis. On sell quickly. Description: An attractive filler product – arching slender stems with clusters of soft pink flowers at the tips of the current season’s growth. White forms are also available. Can be substituted for waxflower - available at the end of the wax season, with similar postharvest handling requirements. Origin: Coastal areas to the north and south of Perth, WA. Flowering season: Early November to February. Typical vase life: 7 - 12 days. Look for bunches with crisp, fresh green foliage. Avoid those with significant bypass growth (it will cost you to trim them back), dropping flowers or where more than 30% of flowers are over-mature (closed and drying). Recut stems and place into fresh water containing a registered biocide. To increase water uptake and improve hydration it may be worth holding the stems in deep water (e.g. 20 cm). Do not mist the flowers. 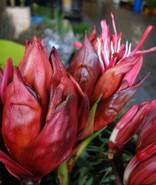 Description: These distinctive flowers have great appeal (especially as the flowering season peaks in December and January!) and a long vase life. Several bell-shaped flowers are clustered at the end of long, straight stems which extend up from the base of the grass-like plant. The number of bells per stem varies, from 4 to over 10. The flowers are typically red with a yellow edge, but flowers are available in a range of tones, from red through orange to yellow. Due to past overpicking from natural stands, Blandfordia is a protected native plant. A licence is required to harvest flowers for commercial purposes - to be confident that the flowers are being legally marketed, florists should look for an official tag on the bunch or stem bearing a license number. Supply is limited due to the relatively small number of growers and the slow growth of the plants, which take at least 3 years to produce flowers. Origin: Blandfordia is a small Australian genus confined to moist heathland areas of coastal central and northern NSW and south-east Queensland. Tips for florists: Avoid stems with deformed or damaged bells, or where the margins of the bells look shrivelled. Avoid thin, weak stems and those on which the lowest (oldest) flower has a papery, withered or shrunken appearance. Recut stems and place into fresh water containing a registered biocide. Blandfordia is not ethylene sensitive. (The photo shows Christmas bells starring in an arrangement by Del Thomas). Description: Willowy stems with many short side branches, each densely covered with whorls of silvery green, slightly twisted leaves and terminating in a flower head featuring yellow to lime-yellow bracts. The bracts enclose a tiny, central cone-like flower, which develops into an attractive silvery woody cone (great for Christmas arrangements!) as the flower head matures. The bracts become greener and open outwards to form an open cup at the stem tips as the flower head develops. Origin: Like proteas, Leucadendron species originate in South Africa. Male and female flowers occur on separate plants. However, ‘Pisa’ was developed in NZ - it is a female selection and is vegetatively propagated. Flowering season: August to November, depending on location. Tips for florists: ‘Pisa’ has a long vase life. Choose bunches with fresh silvery green leaves and avoid those that look dull or wilted. Recut stems and place into fresh water containing a registered biocide. ‘Pisa’ is not ethylene sensitive. Product held too long becomes dull and brown tips develop on the bracts – avoid it!